This free 3Ds Max Geometry Optimization tutorial is aimed to help you learn how to reduce the size of a 3D scene by optimizing the Geometry and reducing the polycount. This will directly positively effect render time and RAM usage. By speeding up the rendering of a 3D scene you free up more time for the creative side of your project, as well as save time & money when you can render your scenes faster, and thus obtain higher client satisfaction. This helpful 3Ds Max scene optimization guide comes from the cool dudes at GarageFarm.NET along with a special coupon for our readers – all details at end of the article! Why Learn to Optimize Scenes in 3Ds Max? Imagine, after many long days and sleepless nights, you finally achieved your desired 3D artwork look. But then, when you hit that render button and heck, it turns out the scene eats up too much RAM, or requires too much computing power to get it done within reasonable time. High RAM usage may cause your scene to crash during the rendering or cause it to render too slow. That’s simply because the program needs to constantly write and read the temporary data from a hard drive. The hard drive is a 1000 times slower than RAM, even SSDs are much, much slower. 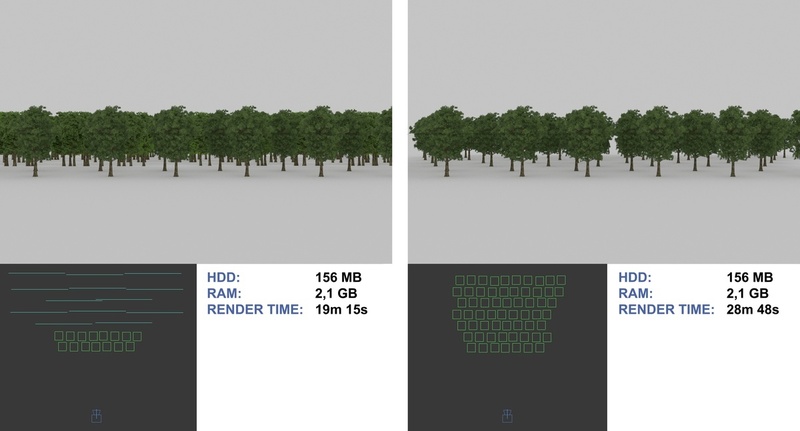 Overblown scene settings such as polycount, quality, and sampling may lead to long render times that in turn may result in a missed deadline, or, when dealing with render farms, you can expect a higher cost. The more hard drive space your project requires (including both the scene and assets), the longer it will load to 3Ds Max. When rendering locally that is probably not a big deal, but in network rendering, you will probably experience longer render times. Additionally, in case of commercial render farms, longer loading time generally equals higher cost. For Whom Is this 3Ds Max Scene Optimization Tutorial? 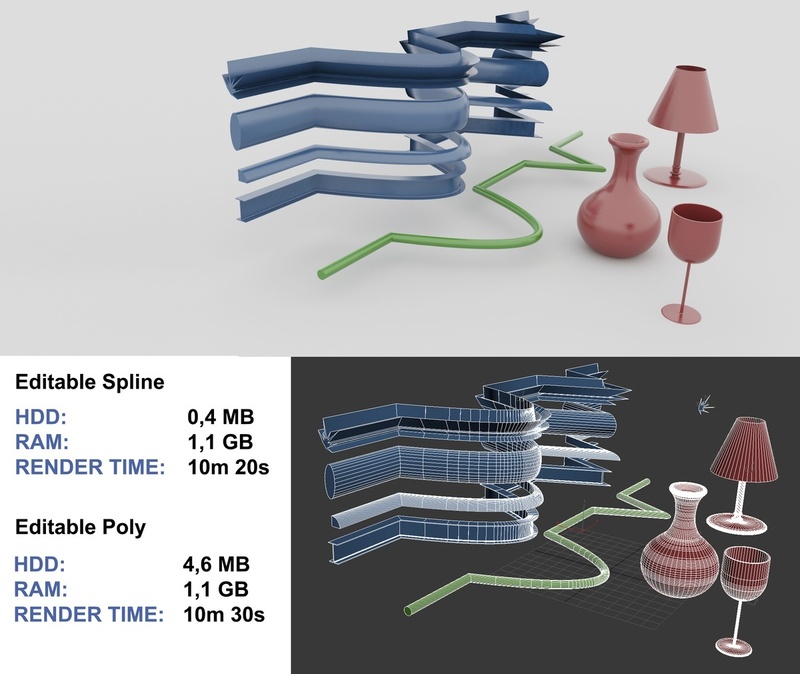 This 3Ds Max scene optimization guide is for every 3D artist who has experienced – or wishes to avoid an unpleasant experience – of overly high resource usage when rendering a project locally, or on a network. 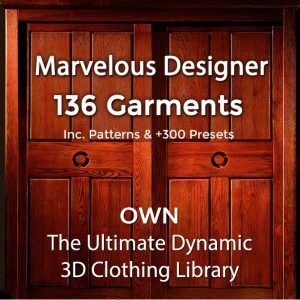 You will find useful 3Ds Max optimization techniques for beginners and intermediates. If you are an advanced 3Ds Max user, you probably already know most of them, however, you might find some new and useful information here. As they say, you don’t know what you don’t know. The optimization methods listed below will be especially useful to 3D animators, as even a slight increase in render time is multiplied by the number of frames in your animation. The more geometry (polycount) in your 3D scene, the bigger the scene file, the more RAM it needs in order to be rendered and the longer the rendering takes. 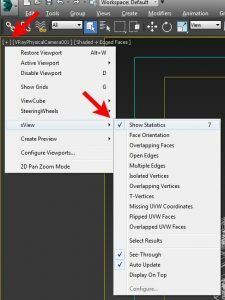 TIP: You can turn more statistics options on and off in 3Ds Max by clicking on the upper-left corner in Viewport (“+”) → clicking “Configure Viewports” → “Statistics” panel. Total – Displays only the statistics for the entire scene. Selection – Displays only the statistics for the current selection. Total + Selection – Displays the statistics for the entire scene and current selection. 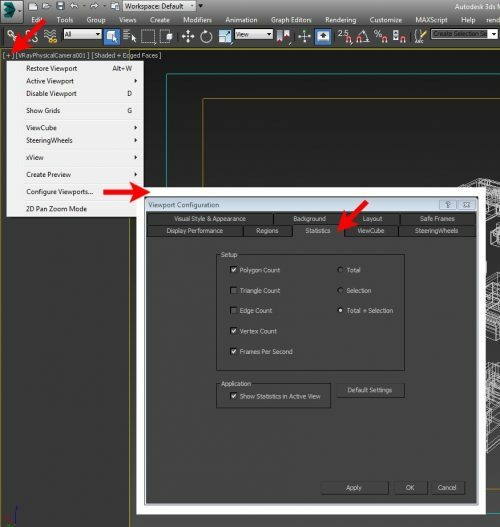 If you want to learn more about 3Ds Max statistics and what they mean, check out Autodesk help. 1.2 Find the Heavy 3D Models. Open the window “Select by name” (press “h”) and add the “Faces” column to the menu. You can do that by right clicking the “Name” bar and choosing the “Configure Columns” option. You’ll see a list of additional columns, one of them being “Faces”. This column will sort all objects in the scene by number of polygons. 1.3 Remove Unnecessary Geometry in 3Ds Max. Delete all the geometry that is located outside of the view of the camera and won’t be visible in the final render. Delete all the geometry that is hidden inside, or covered by other objects. Delete all the hidden models and models on hidden layers, blueprints you used for modelling, and imported CAD drawings. How to find hidden objects in 3Ds Max? In the “Select by Name” window click the “display all” icon. You can find hidden objects in your scene by adding the “Hidden” column, in the same way as “Faces” described in the chapter above. 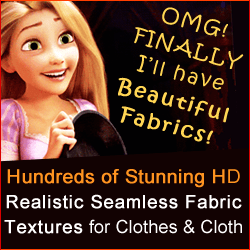 The hidden objects and objects on hidden layers will have the “Hidden”option ticked. 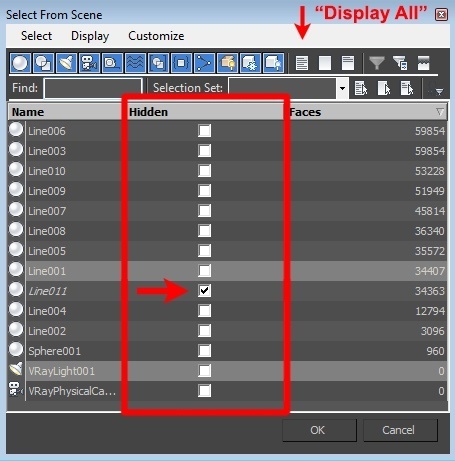 To find the 3D models lost outside of your scene during importing or working on the project, you can right-click on any Viewport and choose the “unhide all” option, with the “Unhide objects on hidden layers” option selected. 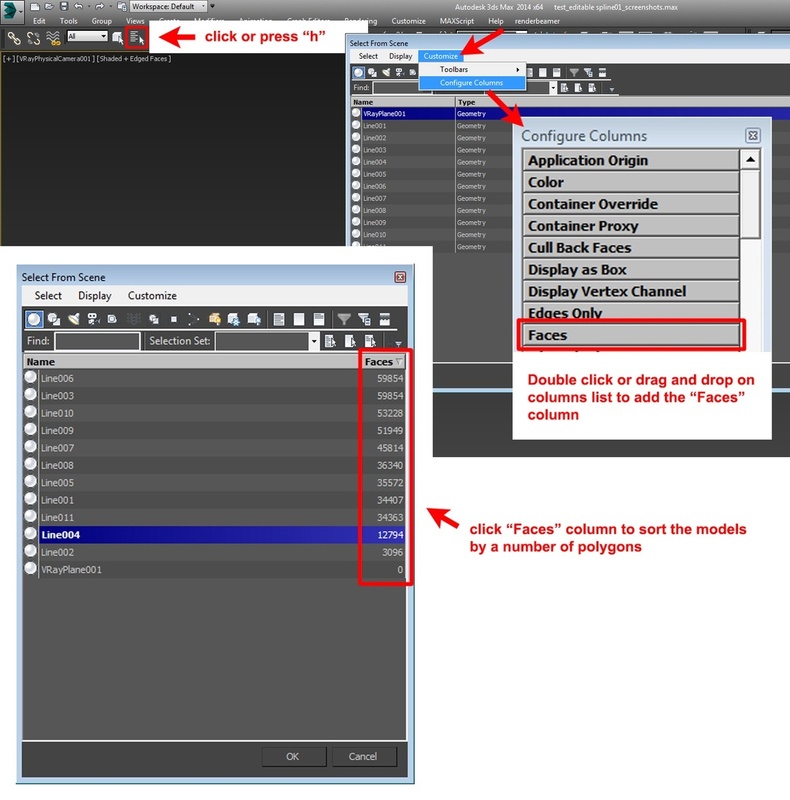 Then, choose the “zoom extents” option in the bottom right corner of the max interface and press “ctrl + a” to select all the models in the scene. Lost models will become visible in the scene. 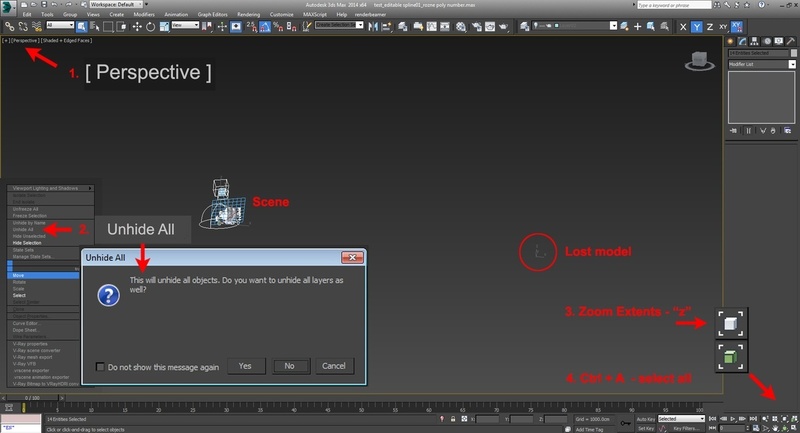 1.4 Use 3D Object Instances in 3Ds Max – Instead of Copies. In 3Ds Max you can copy an object either as a copy or an instance (or reference which is a sort of an instance). When you copy a mesh as a “copy”, 3Ds Max creates another mesh that will be stored in your scene both on hard drive and RAM, which makes the polycount higher. However, if you create an “instance”, 3Ds Max will just store the information that a copy of a mesh is present in another place in the scene but keeping only the data of a single mesh in memory and in the scene file. 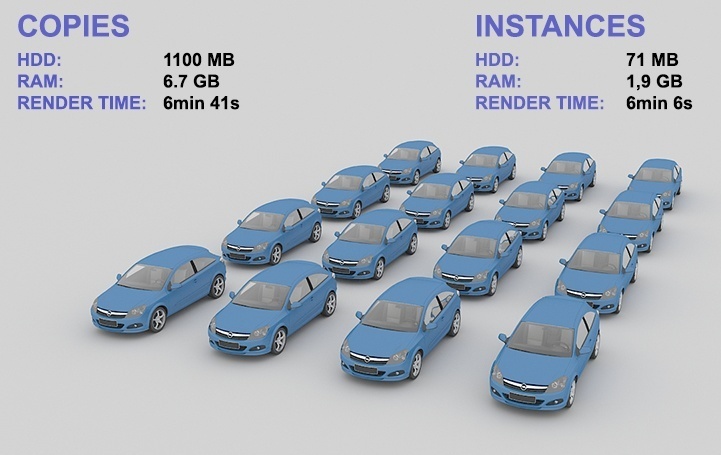 Thanks to using “instances” you can put a huge number of copied objects into the scene but they will use practically the same amount of RAM and have a similar file size as a single object. The only disadvantage of that method is that those meshes must be kept identical to the initial object. Try to optimize all your 3D models based on their distance to the camera or level of detail needed. Adjust the level of detail of models to their visibility in the final render. For example, if you need cars in your visualization, but they are going to be far away, use simpler models or optimize them. A curb on a street can be beveled when it’s close to the camera, but those that are farther away can have sharp edges. Don’t add Turbosmooth or Meshsmooth modifiers if it is not necessary, and keep the “Iterations” value as low as possible. 1.6 Use 3Ds Max Optimizing Modifiers. They can quickly reduce the number of polys in your model, but they might deform its shape. It’s best to use them when the object is far away from the camera, or when it is a high poly object (like a model of a car collapsed after using Turbosmooth modifier). Play around with the settings of modifiers to keep desired detail level, but reduce the number of polygons. You need additional polygons only to create more details in your model. Because of that, models with a dense mesh on flat surfaces are best candidates to apply this kind of optimization. Models with irregular shapes (like rocks) don’t need to retain their exact shape to look good, which also makes them good candidates to apply optimization modifier. In order to reduce the scenes size and its resource usage, you will need to collapse the model with the optimizing modifier applied before the rendering, especially when you are going to render it via a network. Always remember to save a copy of the scene before making changes to be able to revert to older settings in case something goes wrong. 1.6.1 – Using the Optimize Modifier. The Optimize Modifier in 3Ds Max lets you reduce the number of faces and vertices in an object. This simplifies the geometry and speeds up rendering while maintaining an acceptable quality of the image. A Before/After readout gives you the exact feedback on the reduction as you make each change. Go here for more information about the 3Ds Max Optimizer Modifier. 1.6.2 – Using the 3Ds Max MultiRes Modifier. The MultiRes Modifier reduces the memory overhead needed to render models by decreasing the number of vertices and polygons. MultiRes offers several advantages over the Optimize modifier including faster operation and the ability to specify the level of reduction as an exact percentage or vertex count. 1.6.3 – Pro Optimizer Modifier. The Pro-Optimizer Modifier lets you select objects and interactively optimize them. 1.6.4 – The Batch Pro Optimizer Utility in 3Ds Max. The ProOptimizer feature is an optimization tool that helps you reduce the number of vertices (and also the number of faces) in an object while preserving the object’s appearance. Its options let you maintain material, mapping, and vertex color information in the optimized model. 1.7 Use Pre-Rendered Planes with Textures – Instead of 3D Models & Shaders. Sometimes you need to create an environment for your scene outside of your camera view but affecting your scene by appearing in reflections, casting shadows or illuminating it with indirect lighting (GI). In that case, keep the 3D models which create such environment simple or replace them with planes with pre-rendered textures added, and cut them out with opacity map if this is necessary. That method is especially efficient if you want to create a large amount of foliage visible in reflections or casting shadows on the scene. If the opacity maps render too long, please check out the Textures guide (Part 2) to know how to set them up to render much faster. A comparison of rendering a 3D model with a reflection of environment created with instanced models vs. pre-rendered planes with opacity map. A comparison of rendering far-away objects as models vs. as pre-rendered planes with opacity map. A comparison of rendering of multiple 3D objects with refraction and blurry reflections rendered as models vs. rendering them as pre-rendered planes with opacity map. 1.8 When Should You Collapse 3D Models? The methods listed below can reduce your scene size on hard drive, so that your project will upload and open in 3ds Max faster, which is important in the case of rendering via a network or a render farm. Models with optimizing modifiers applied should be collapsed before rendering. It will reduce RAM usage, rendering time, and the size of the scene on a hard drive. 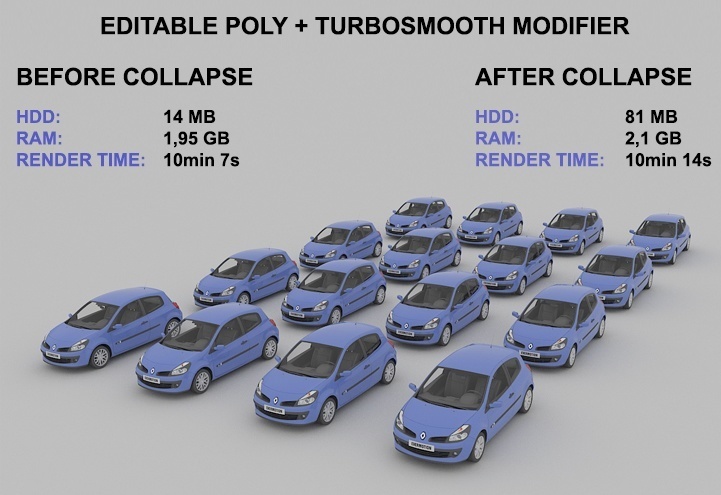 Meshsmooth and Turbosmooth modifiers – Keep the models simple with modifiers applied to them, instead of collapsing them into editable poly or editable mesh. You will be able to correct the density of the mesh if it is too high and models will be saved on the hard drive in their simpler form, so your scene will weigh less. A comparison of resource usage when rendering 3D models with Meshsmooth modifier applied on them vs. a 3D model after collapsing the stack to an Editable Poly. The models are copied as instances. Editable splines – You can create dense 3D models using modifiers like Lathe, Sweep or the “rendering” option in the editable spline options in 3Ds Max. They will be saved in your project as smaller data in comparison to models collapsed to editable poly. A comparison of resource utilization for editable spline with 3D options/modifiers applied in 3Ds Max (Lathe and Sweep) and after converting them to an editable poly. When it comes to geometry optimization, the rule is simple – the less, the better. 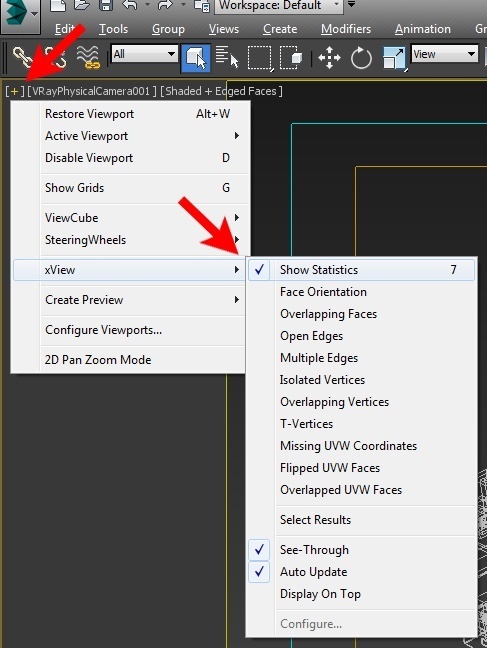 Statistics information in Viewport and the “Faces” column in the “Select by name” window in 3Ds Max will help you find the geometry you need to optimize. Usually, most of the scene models are not heavy enough to invest time into optimizing them. Finding the heaviest and reducing the polycount should do the job. Using instances is one of the most efficient and easy ways of quickly reducing the polycount of a scene. Some render engines, like Vray or Mental Ray, have implemented tools (mr Proxy, VrayProxy) which combined with the “instances” option will allow you to optimize the scene even more. We will cover them in the next parts of this guide. Using 3Ds Max optimization modifiers can be time consuming at first, but after some time you will find the settings that work for you. If you work on a repetitive kind of projects like architectural visualizations, you will be able to create your own library of optimized models. Planes with pre-rendered textures are a good way to reduce the render time and resources demand. They work the best for reflections and objects which are far away from the camera, thus will be seen from a similar angle regardless of the camera location. In case of stills the time needed to create and render them might not be worth the effort, but when you render an animation with many frames, the planes can make a big difference. Editable splines are a 3Ds Max tool that can help you create large geometry which will not affect your scene size, especially when you work on architectural visualizations. Their level of detail can also be modified depending on given needs. It is good to apply all of those optimization techniques as a part of your workflow as you work on your scene rather than attempting to optimize it when the scene is already finished and the final render times turn out to be too high. In the long run, such workflow can save you lots of time and money. Please consider all those methods as suggestions only. Their effect may vary depending on your scene setup, plugins and the render engine you use. It is best to run a test of several frames of optimized scene to check the effect before the final render. This article was created by the cool dudes at GarageFarm.NET, who offer professional cloud-based rendering services to anyone involved with CGI. Whether you’re a freelance 3D artist, a graphic designer, an architect, or a professional film studio from the most remote place on Earth, GarageFarm is able to provide you with sufficient computer power that’s cloud-based, combined with flexible pricing to meet your needs. Use Coupon Code “CGELVES1” when opening account to get $50 free credits. You’ll be able to test them out with all features enabled and without any commitment.